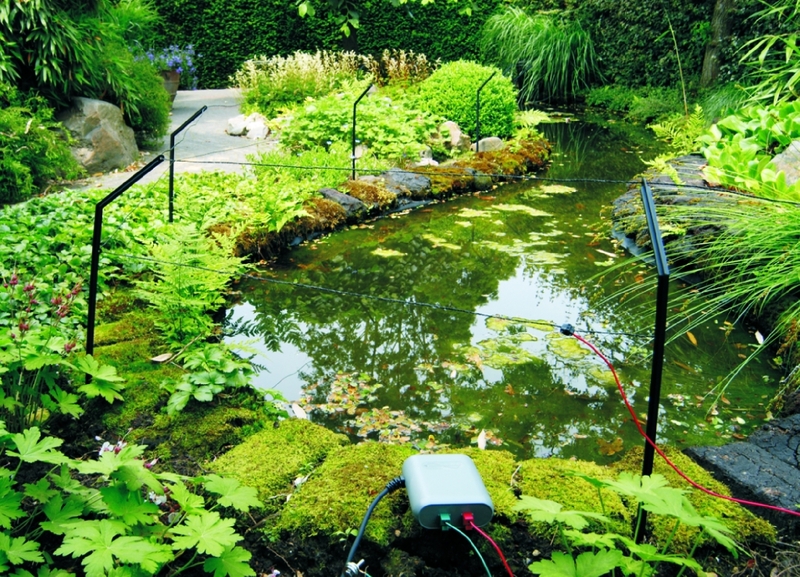 How do you protect your pond against objectionable guests? You spend much leisure on your pond and fish. You might even call it a pond hobby. How frustrating is it then if you see your loved fish disappear one after one. Cats and especially herons will fish out a pond if they get a chance. In our country, having abundant water, the grey heron mostly is an unwanted guest at the pond side. On his long feet he is walking through shallow pond water looking for an easy prey. The superfast movement of the long bill will surprise pond fish. Fish measuring up to 30 cm will be swallowed down in one time by an adult heron. You do not let that happen, do you!? How do you protect your pond and can you keep them away from your pond? There are various methods to protect your favourite fish against herons. 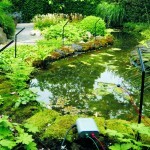 A simple and effective method is to stretch electric fence wire round a pond edge. If they touch it there will give a shock reaction to the effect that herons and cats will quickly take flight and never return to your pond. Another method is to use a pond cover. Herons will not be able then to approach fish and will leave. Pond covers are available indifferent sizes so that there is an appropriate cover for every pond. More advanced systems have a motion sensor which detects any arriving herons and / or cats. Detection will be followed by a strong jet of water in the direction of the invader or by flashes of light and shrill sounds. In that case the unwelcome guest(s) will draw away at once. Reflecting daylight is also effective to keep herons at a distance. They will be shocked by the restless light reflections, caused by a glittering spinner or a silver ball. Besides, such glittering heron scarer is a decorative element in your garden. 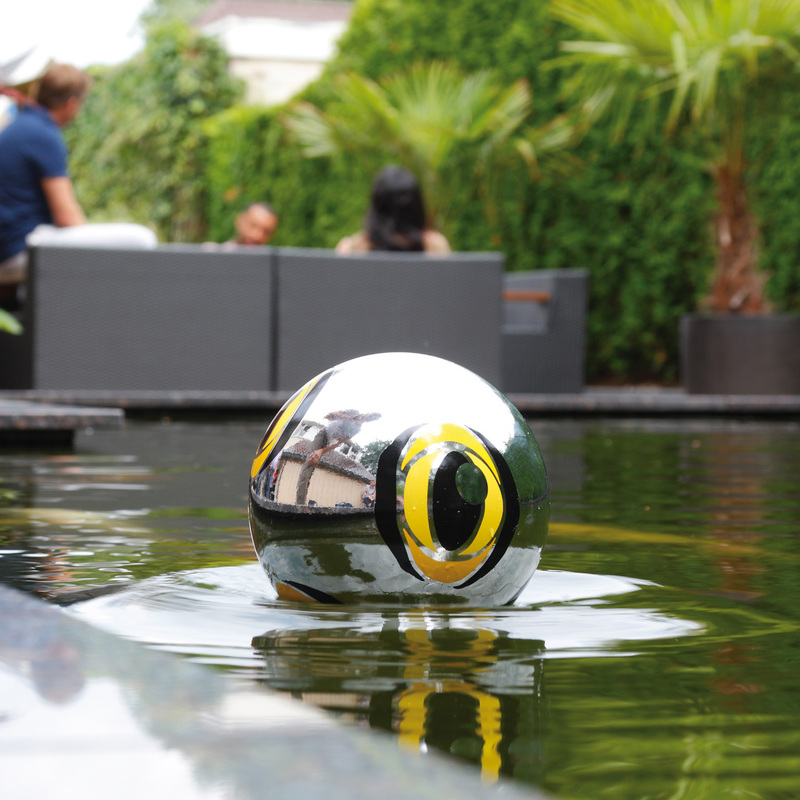 Put a number of floating balls in your pond to bring about a strengthening effect.